The following is a transcription of E R A HEADLIGHTS for December, 1959, page 8. The text is from a column by Arthur Schwartz entitled "New Orleans CAR NOTES". It lists the streetcar roster and car assignments to stations (car barns) and lines. The column was accompanied on the same page by a track map, which is also shown below. The map shows the entire system at that time, and includes insets showing the layout of the two stations. Notes by this editor, not part of the original publication, are given within [square brackets]. Copyright © 1959 and 2007, Electric Railroader’s Association, Inc. All rights reserved. Reprinted by permission. At a slow but steady pace, New Orleans Public Service, Inc., continued to reburbish its 85 double-end steel cars, a job begun over a year ago. It includes installation of headlining in the platforms, replacing the former interior reddish-brown paint with a light blue on walls and seats (even controller), with a white ceiling. Old paint is actually removed, and the outside gets the usual pleasant coat of dark green. NOPS' double-truck, arch roof cars of the 800-972 series were built by Brill (75) and Perley A. Thomas (98) in 1922-4, with the 800s and 900s differing only in that 800s have hand operated doors, 900s air operated. These 21-ton cars are powered by two 65 hp motors. Carrol[l]ton Station (for St. Charles line): 803, 804, 814, 816, 821, 823, 827, 832, 836, 846, 848, 850, 857, 865, 866, 871, 946 to 949, 951, 953, 957 to 969, 971, 972; 37 cars. 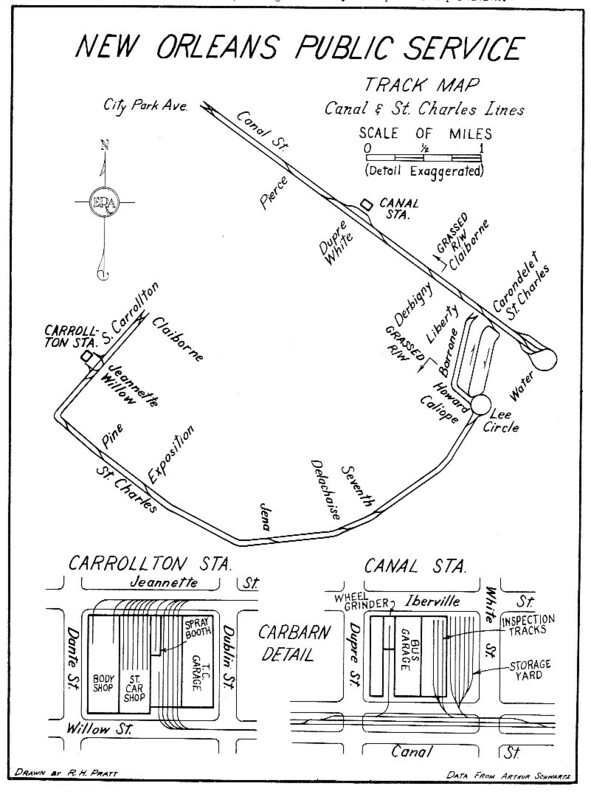 Canal Station (for Canal line): 900, 902 to 915, 918 to 945, 950, 952, 954 to 956; 48 cars. As for work cars, single-truck grinder 29 is at Carrol[l]ton Station, and an un-numbered double-truck crane (isolated, not movable) is at Napoleon Training Station.